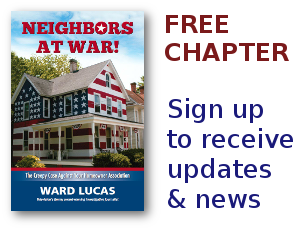 HOA Blogs Archives - Neighbors at War! 5 Comments on Listen, As Never Before! On American Independence Day 2014, is it time to implement “Equal Justice Under The Laws” For HOA & Condo Owners?” Are legislatures willfully violating our citizen rights? If so, why? Are the following not true? – Federal Laws require all states to comply with the US Constitution as the Supreme Law of the Land. – States are required to support and defend the US Constitution when passing statutes and implementing regulations. – States, counties and cities are required to support and defend the US Constitution in their statutes, regulations, rules, codes, etc. that bind all citizens. 6 Comments on How Can We React? It has dawned on me several times over the past few years that HOA outrages are most often reversed when a rogue HOA gets a ton of phone calls and email from angry people across the country. If you know that you, as a board officer or manager, are being watched by the whole country, you might be a little less rotten to your neighbor. In a well publicized case where an HOA official’s viciousness is widely publicized, would that official be more willing to step back and mull over the action he or she is planning to take? Certainly, when you lift up a big rock the vermin tend to scatter in the light of day. Hoo, Boy! Here’s The Next Lawsuit! 1 Comment on Hoo, Boy! Here’s The Next Lawsuit! Those Southern Mississippi boys shore know how to screw up a state! The new community of Diamondhead is holding its first city election. The law allows political signs to be placed anywhere except city property. But the Diamondhead Property Owners Association doesn’t allow any political signs either. Unless you’re a Republican. Mayoral candidate Carl Necaise put his political signs out in the yards of people who weren’t actually in the POA. And he’s ordered his opponent’s signs removed because they happened to be in the front yards of people who actually are POA members. Wow! Jan Bergemann, you are somethin’ else! I didn’t think your proposed legislation had a ghost of a chance of even getting out of committee. But Jan, my brother, you have accomplished a miracle. Just remember it’s only a small step, and you’re up against a massive HOA tort industry that will do anything in its power to ruin you, your reputation, your health, your bank account. Remember, you’re threatening the income stream of a very powerful and unscrupulous monster.